We here (actually just I, the others don't know about this proposal so if this is out of place you can put the blame on me) at TAY have an important request to make. First of all, Happy New Year to the Kotaku staff and all of TAY! With 2014 officially in full swing, I believe it's time that we start things off right with small ideas that can lead to big changes. Today, I want to bring up the notion of overhauling the current TAYblip featured on Kotaku once a day to help build a larger and more enthusiastic audience that would create immediate benefits for both TAY and Kotaku. I should first start by saying thank you to the Kotaku staff who have always had our backs, and shared to their readers the work we produce on a daily basis. We're big fans of your work, which is why we're here in the first place, so again, thanks! To illuminate the issue, we should address the problem with the current TAYblip that represents our community. Generally speaking, the overwhelming majority of all TAY posts appear in such a fashion. This shout out to TAY and invitation to Kotaku readers to delve into Talk Amongst Yourselves is largely uninviting, and is easily lost within the line up of posts on Kotaku on a daily basis. Even still, these are not numbers that TAY as a community who creates content exclusively for TAY and Kotaku deserve. Where exactly do the issues lie, then? Your devoted readership is either unaware of such a platform for them to join, or is uninterested and has no idea what they're missing out on due to the unappealing nature of the blip's presentation. Your readers scroll past the current set up and style of TAYblip and I have a few ideas that can change that. Woah! All of a sudden, we're looking at a few thousand hits, with a boost in discussions within that very blip! More importantly, the articles written by your beloved readers get the attention they deserve! Now we're getting somewhere! It's not Kotaku numbers, but for TAY, this is quite impressive. Which is kinda sad in hindsight, but what we're used to. But all of that can change. At this moment in time, I truly believe that TAY does not get the attention it clearly deserves. I have been here for a little under half a year and I can see that this community is unlike any I've come across before. We here at TAY have become more than just gamers with a few shared interests. We are readers of Kotaku who love what you all contribute and in many ways echo your love for the subject matter at hand with our own articles, reviews, thoughts, and opinions. We are writers and artists who have so much to say, and our talented users deserve their work to be shared and enjoyed. Of course, this is a simple mock up subject to change but the direction is readily visible and the changes would go a long way in giving TAY more than just a blip on the radar. 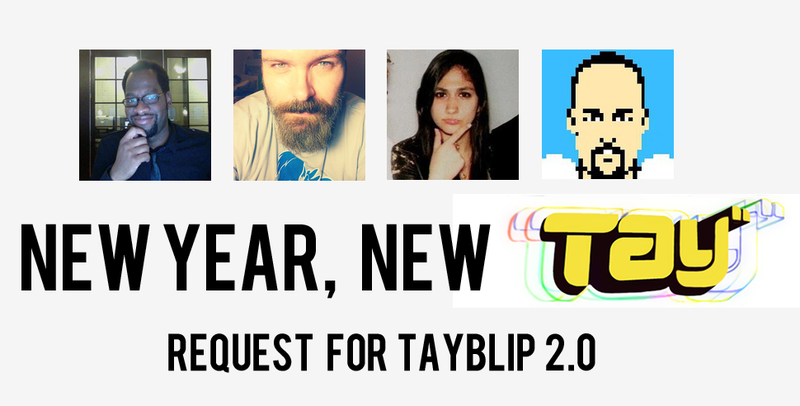 Here in this redesign, the TAYblip is lead by a new header image. This in-body header has the new TAY logo (requested to me by Giantboydetective two nights ago) emblazoned on it that will be key in teaching readers that we are a legitimate branch of your site. The new logo mirrors Kotaku's in sealing a certain sense "authenticity" in this connection. Readers will feel compelled to check out this reader-run section knowing its sanctioned by Kotaku and run by their own people, whom they could relate to. When these new readers realize this is a legitimate community made up of users they've seen comment on main page articles, they will feel encouraged to join and interact with faces they're familiar with. Part of the current problem I believe is that your readers aren't exactly sure what TAY is, and what it's role is as part of the Kotaku brand. 1) People have no idea that TAY is even...a thing. 2) That they're willing to contribute and join the community. There are plenty of users out there that probably share this reader's sentiments, and we have to get TAY to them. Right now, we are showcasing the entirety of TAY's talents and individuality by sharing one smushed up paragraph. The new list let's the articles on display breathe, and now introduces readers to the title of the article to make the whole format feel formal and more dignified, which reflects the change TAY went in 2013. The username and a short description accompany the title of the article to round things out. The last of the requested change would be to have the TAYblip be shared at a consistent time on a daily basis which would subconsciously make TAY more familiar and welcoming to Kotaku readers. Because a number of Kotaku writers take on the small task to post the current TAYblips, there is no set time, no uniformed decision as to what time they are posted. Times of posting the blips all vary: Some days it may be posted is posted at 10 a.m, others at 12 noon. By posting at the same time consistently, regular readers of Kotaku will be able to get into a rhythm and adjust into a routine of waiting and then expecting TAYblips to appear. That way, newly initiated Kotaku and TAY lurkers can invite themselves at their own pace. I believe an ideal time would be any time between 12 noon and 1 p.m- At this point of the day, readers are fully awake and going about their days. Many may be taking lunch breaks at school or work, giving them a chance to check out TAY should they wish. Also, you guys get to have lunch at the time and won't need to keep readers busy while they look at our stuff! Yay lunch! How I got the idea for this rework is by observing and recording the spikes in views whenever our work went live with TAYblips. For sites like Kotaku , imagery can be a sole-key factor to the amount of pull an article can get. It's obviously no secret that readers react well to specific imagery - its the understatement to end all understatements actually. It wasn't until recently when TAYblips had pictures accompanying them when traffic began to boom. When a few of us noticed this spike, we discussed it for a brief moment with Evan only to find out its because its personal artwork being used and that's why it was more or less "safe" to post. I urge Kotaku and their art department to give our TAYblips some life with a header that reflects the articles for the day, and brings our community into visibility. I know it is a large favor and request, and that asking for even one new header a day for TAY adds up...But I truly believe that as your readers, as your audience who contributes for the benefits of TAY and Kotaku, we deserve it. We share your interests, and our passion for creativity in writing and art are equal regardless of our occupations. Making this change is the pull that gets people to notice TAY, and our new Tayblip format will finish the combo by reeling in these viewers. To wrap things up (finally, I know! ), as mentioned earlier in this pitch, the rewards for taking this new direction can be enjoyed by both TAY and Kotaku. First and foremost, TAY and its contributors get a chance to show off their hard work to more people, and more importantly, their intended audience. This will allow our writers and contributors a a chance to receive more constructive criticism to better themselves at the craft, a wider range of opinions that will make for more interesting conversation, and an opportunity to make new friends. We here look up to many of you working at Kotaku, and you giving us a chance to flex our own muscles inspires us furthermore. With new members come new authors and artists who can share their passions and are free to express themselves without fear. This means more content for Kotaku to share and show-off their talented readers, and gives you an opportunity to gain lasting fans who would only have good things to say about an online community - a rare commodity. As for Kotaku, exposing TAY to the rest of Kotaku will allow regular readers who will soon learn to enjoy TAY to return to the site more consistently. Thus, greatly increasing their time spent on Kotaku and Gawker Media websites, delivering more clicks and views that are a large part of determining the success of your posts. Because of what we do here on a daily basis, we've created friendships and bonds and are bettering ourselves in all sorts of ways. To put it simply, TAY is a community that always gives back. Editor in Chief Totilo sought to make a Kotaku for everyone. TAY is an opportunity to set Kotaku even further apart from competitor sites like IGN and Gamespot. These sites all draw in viewers and readers but lack one thing - a strong, supportive, friendly and productitive community - which we are currently in ownership in the form of TAY. From starting up a Design a TAY mascot competition thread, to game and movie nights, hell even running our own successful Secret Santa project, we've proven time in and out that we can come together and make this spot on the internet a safe haven for fans of all that which you report on Kotaku. I know this has been a long post, but it wouldn't be Stormborn/Bonny John certified without giving you details, mock ups, reasoning, and background information necessary to make Tayblip 2.0 a reality. 2014 can be a big year for TAY and Kotaku. Thank you for taking the time out to read this request and I hope we can all work together to give TAY the voice it needs to call out the rest of Kotaku. Cheers, and once again, Happy New Year!